A little more than a month ago, I was given an opportunity to preview Bible Illuminated: The Book New Testament. Last week, I received the book in print. And the electronic preview was nothing compared to opening the envelope and pulling out this book. The first thing that struck me by surprise was the print format. Its a magazine of sorts. Think Life’s Year in Pictures review. The book is printed on thick glossy pages, and the pages flip like your favorite magazine. Brilliant! If you want to re-create something old into something new, without the feel of the old, then, make the new more attractive. Bible Illuminated did just that. Like my favorite magazine, I’ve picked it up several times over the last week, continuing where I left off. The pictures are more powerful in print than they were electronically. Don’t get me wrong, I get a great deal of enjoyment looking at great images online. There is something very aesthetically pleasing, for me, about high resolution pictures on a computer screen. In The Book New Testament, the pictures have captions embedded and under the images. On the page next to or right after, the exact same text is highlighted. Again, here’s the brilliance – one can’t help but begin to look ahead to where the text is in the scriptures and read for context. I’ve read more scripture in the last week than I have in the last ten years because of this. “Look, you scoffers! Be astonished and die! For what I am doing today is something you will not believe, even when someone explains it to you.” is inlaid in a picture of arm braces to help a man with one leg walk – yet, they are laying on the ground and the only picture is his running shoe in the air as he’s jumping. Then there is a two page spread with a caption that says: Murray’s Dream Team is a football squad made up entirely of athletes with one leg. The players are residents of the Murray Town amputee’s camp, which is home to victims of rebel atrocities committed during the civil war. Freetown, Sierre Leone (remember my review of A Long Way Gone by Ismael Beah? Same place). This is the way The Acts of the Apostles begins. Throughout, there are pictures of anti-globalization activists dressed as clowns taking part in a demonstration against refugee policy of the Group of Eight in Germany; pictures of the English Women’s Suffrage movement. Want to know what the picture is? Its a picture of a man’s hand putting gas in his car. Just let that mull around in your mind for a little while. 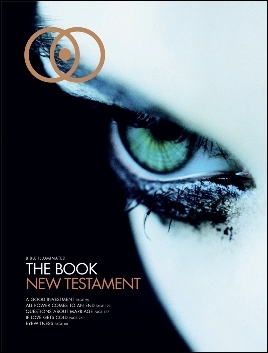 Now, let’s be clear, the images are not the only thing of signifance in The Book New Testament. The images are a catalyst to make you think about what the text is saying. The designers of this book, also used another technique of great relevance. As you leaf through the magazine style book, on a majority of pages, there are pull quotes that jump out at you. You know what I did? I read the whole page of text. Its from 1 Corinthians and the title of the part above the pull quote is titled The Resurrection Body. The section below it is The Offering for Needy Believers. I didn’t see the picture caption text anywhere on that page. I flipped the page and saw the text highlighted under Paul Gives Thanks to God. Ah, but then I saw another black box with white text in the middle column. This box was in the middle of The Change in Paul’s Plans and Forgiveness for the Offender. Upon opening this book for the very time, I read two pages of scripture just because I wanted to find the relevance to the picture, the caption, and the pull quote. Brilliant, right?! The creators of Bible Illuminated The Book New Testament have gotten me to read a significant portion of the New Testament in a little less than a week, just because they’ve used visual aids to related to the text of the Bible. Receiving Bible Illuminated: The Book: New Testament has been nothing short of an astounding experience. I truly recommend picking up a copy of this. This is one of those books I would put on a coffee table during a get together, and watch how many people pick it up, leaf through it and become absorbed. And I believe the conversation that would result from doing this would be incredibly insightful. I suspect, the designers of Bible Illuminated, Michel Gyring and Mats Rabe of Stockholm, Sweden, were completely right in thinking this would be a great way to get people talking about the things that matter again. I have even found myself digging through the many different versions of the bibles I own to compare the different translations. Previous post: The Sunday Salon: GO VOTE!